As all big fans of Harry Potter, (or ‘Potterheads‘) will know, this is a very important week indeed. Monday 26th June marked the 20th anniversary of the first book, The Philosopher’s Stone being published. In the two decades that have ensued, the hearts and imaginations of children and adults worldwide have been captured. Many have been celebrating, and J.K. Rowling has thanked her fans. 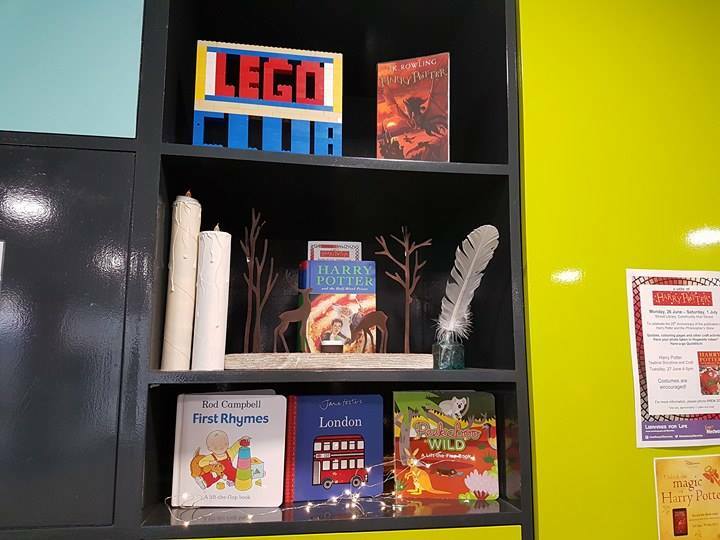 When I found out that Strood Library/Community Hub were also celebrating the 20th anniversary, I was so delighted that I almost felt 8 years old again! 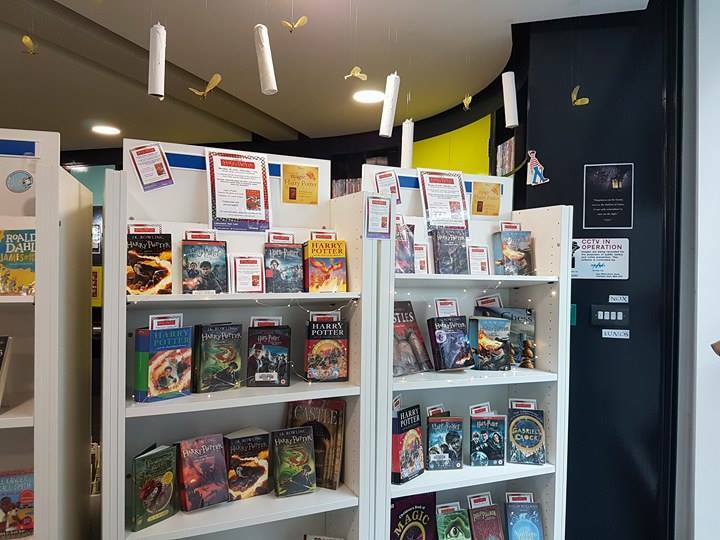 The children’s section of the library has taken on something of a makeover this week (from Monday 26th June until Saturday 1st July). 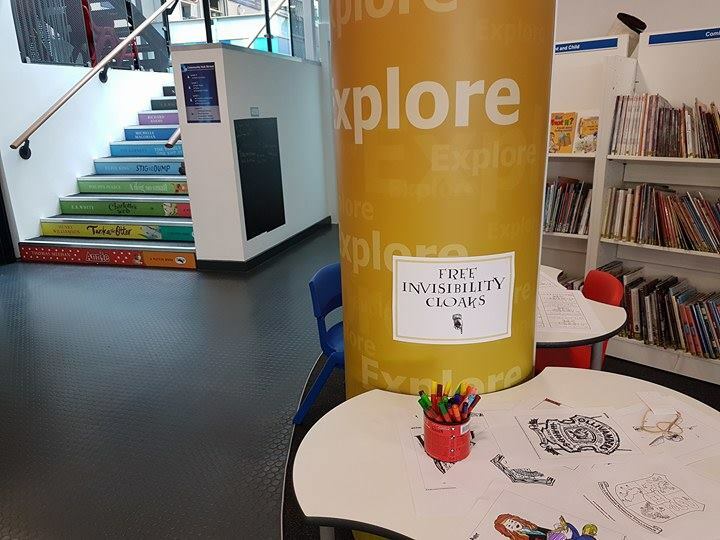 Children can colour in Harry Potter related pictures and pick up a free invisibility cloak while they’re there. The problem was, I couldn’t see any! Tuesday morning’s ‘baby bounce and rhyme’ session sees parents sing nursery rhymes with their babies. However, this week it had a magical twist. It was led by Professor McGonagall and Bellatrix Lestrange (who hates cuddles) and many of the songs contained Harry Potter references. For example, Old McDonald had a hippogriff on his farm and in the Wheels on the (Knight) Bus, there were Aragogs on the bus! Around the library, Harry Potter books are proudly displayed and themed decorations hang from the ceiling. It’s clear to see how much thought and work has been put into this event. 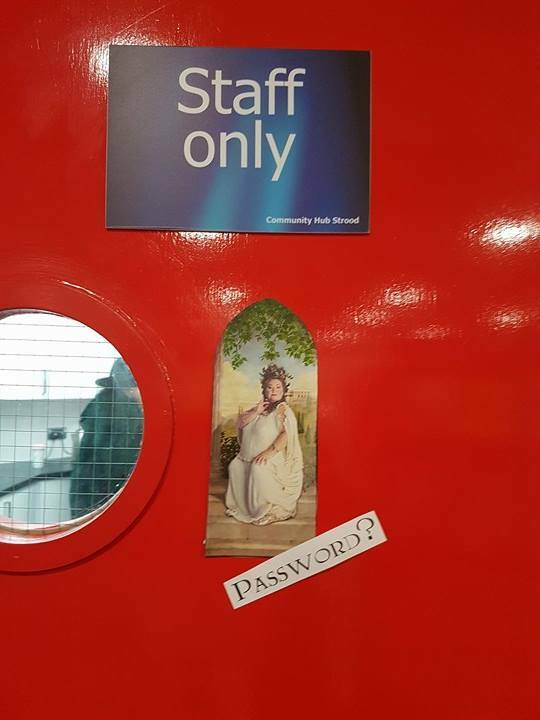 If you want to get into the staff room, you have to tell the Fat Lady the password! Fortunately, I managed to stop Autumn from crawling into the staff room before the Fat Lady got alarmed. 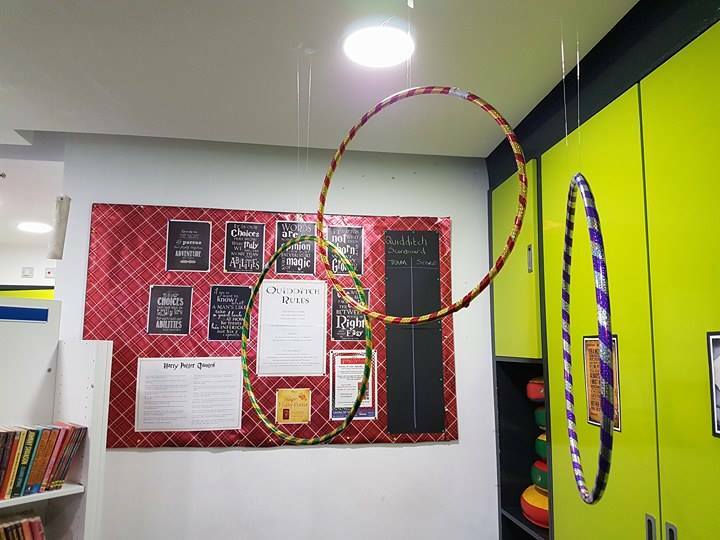 As well as all the other wonderful decorations, the children’s library also has a Quidditch area, complete with Quidditch hoops! In case we got hungry while we were enjoying colouring in and reading, there were lots of magical snacks available. 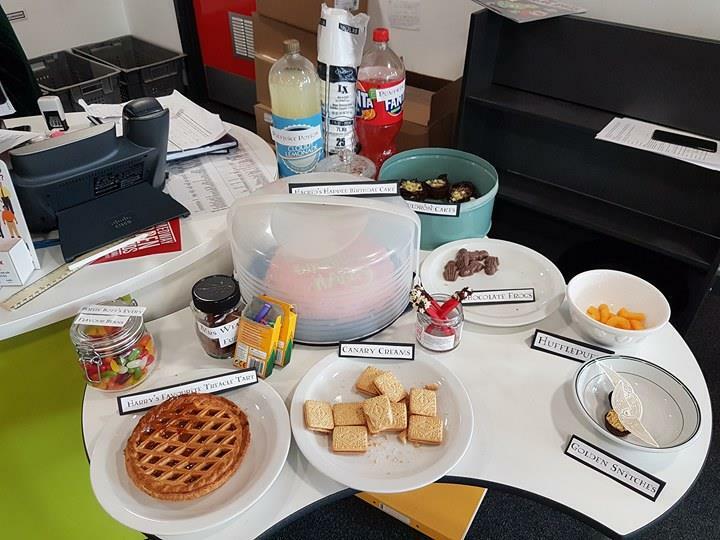 Treats included Canary Creams, Golden Snitches, Harry’s Favourite Treacle Tart, Mrs Weasley’s Fudge, Cauldron Cakes, Chocolate Frogs, Hufflepuffs and Bertie Bott’s Every Flavour Beans. Polyjuice potion and pumpkin juice wass available to wash it down with. 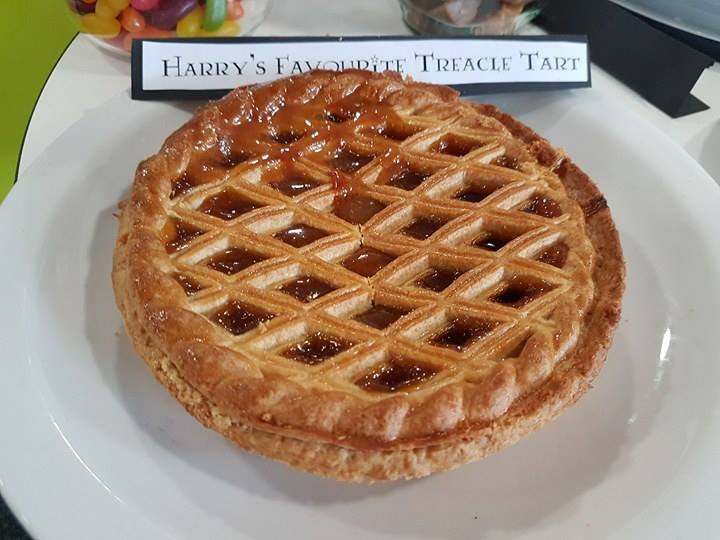 While I’m not a fan of treacle myself, the treacle tart did look very good! 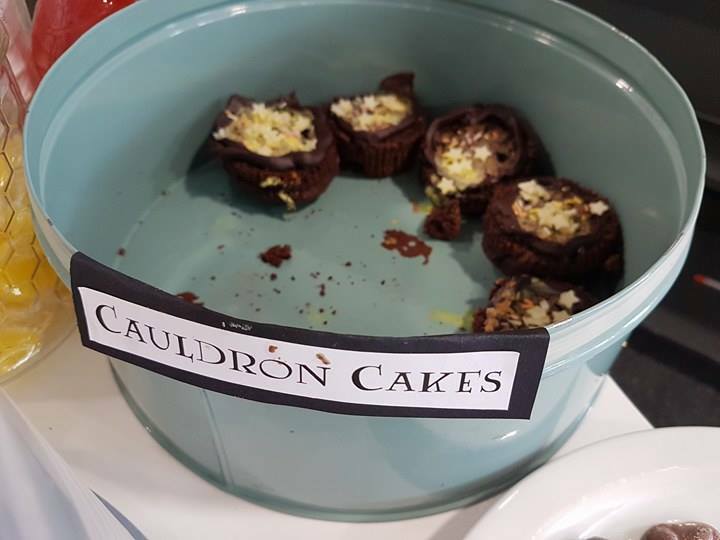 The Cauldron Cakes looked fantastic too. Unfortunately, there weren’t many left as a gaggle of witches and wizards had snaffled a lot of them on their way home from Hogsmeade. 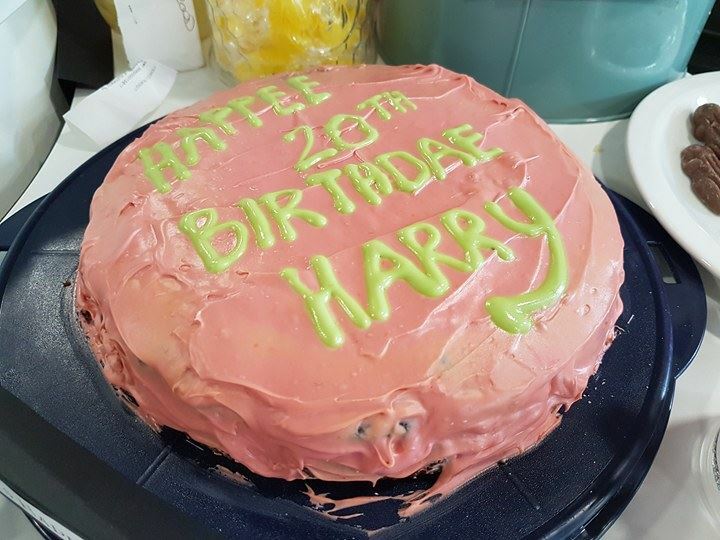 We all sang “Happy Birthday” to Harry Potter, before tucking in. It was chocolate and cola flavour, and very tasty! 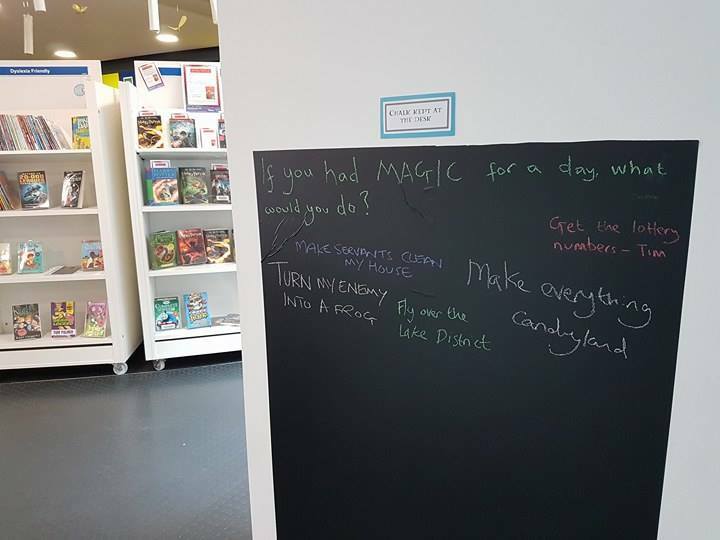 While you’re in the library, you’re invited to write what you’d do if you had magic for a day! I wrote that I’d cast a spell to make grumpy people happy. I thought turning your enemies into frogs or getting the lottery numbers were also great ideas, though! 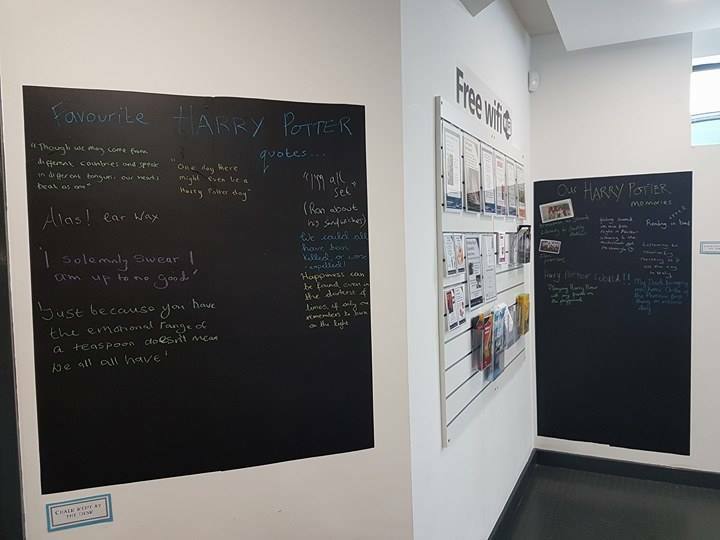 There are also chalkboards where you can write your favourite Harry Potter quotes and memories. However, perhaps the best part of all, is the Harry Potter dress up area! 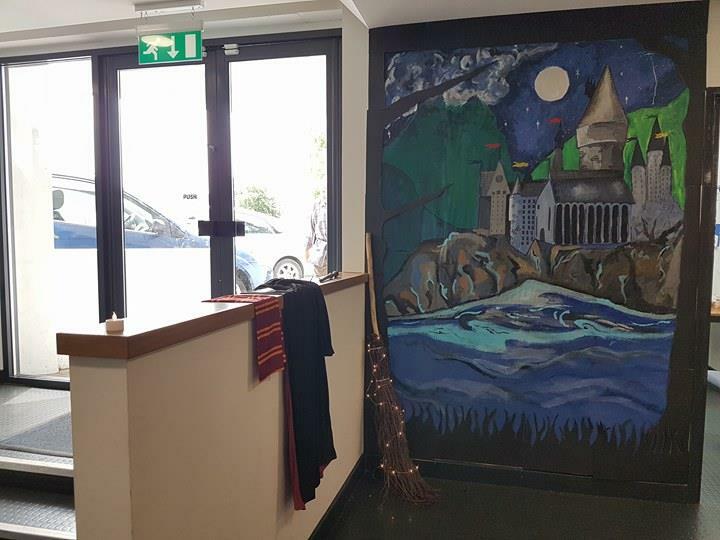 There is a beautiful backdrop of Hogwarts by Polly Martin, with props available. These include robes, a scarf, Harry Potter’s glasses, a wand, and a lit up broomstick. However, wearing your own fancy dress to the library is also encouraged! Autumn and I quite got into the spirit! 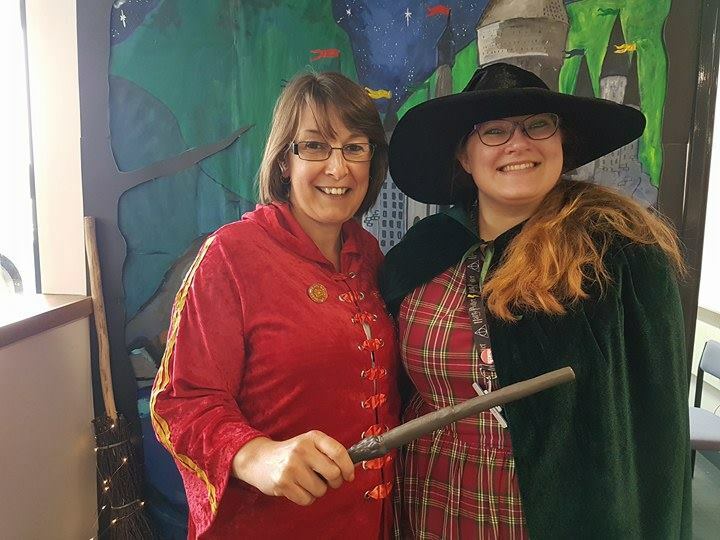 It was great to see the librarians getting into the spirit! 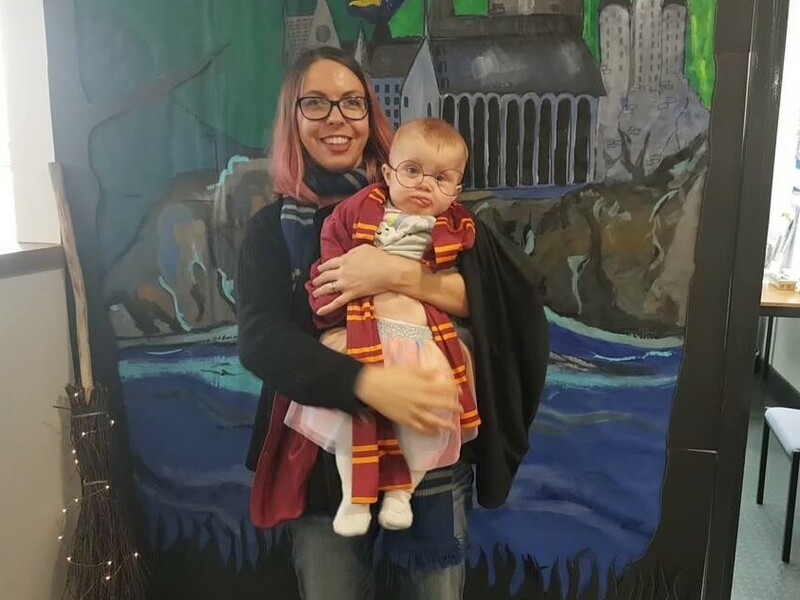 The planning was down to Emily, on the right, who is a huge fan of Harry Potter! The same age as me, she’s grown up immersed in the world of Harry Potter. 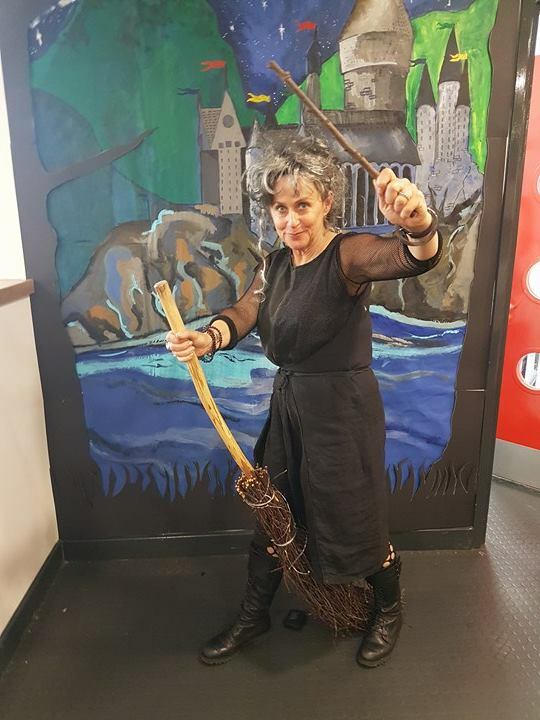 I didn’t manage to capture a picture of Bellatrix Lestrange in the morning, as she went to Aldi (who knew that allies of Voldemort shopped in German discount supermarkets?) However, I did managed to get one when I returned in the afternoon! When we returned in the afternoon, there was a storytime where we were read an excerpt from The Philosopher’s Stone and two other magical stories. 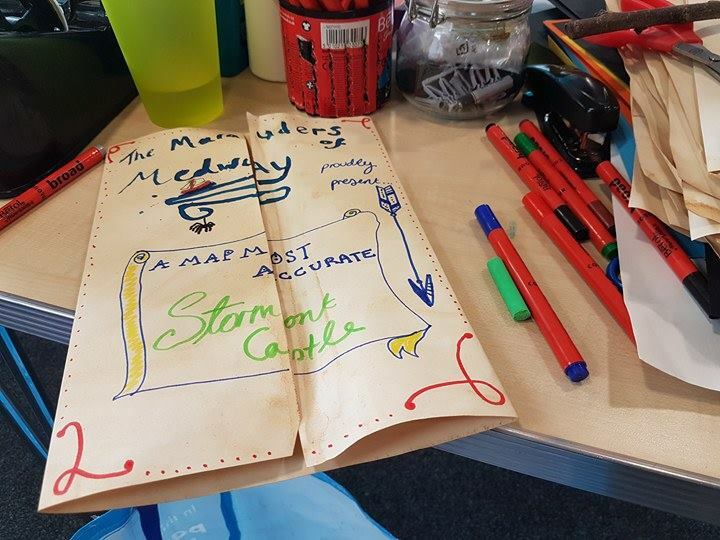 Afterwards, children could make Marauder’s Maps with ink and quills. While today was the main day of the event, there will still be some activities, such as colouring in and a scavenger’s hunt, available to do over the next few days. 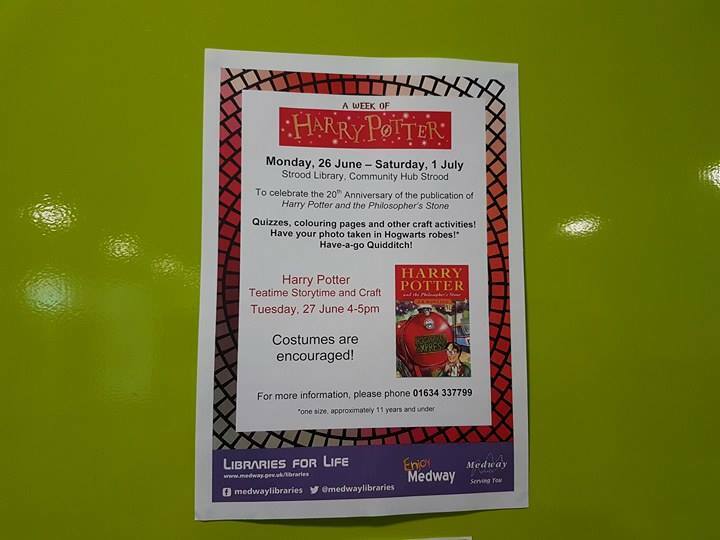 Do let me know what you think if you visit the library this week. I’m sure you’ll have a magical time! Oh I love that they made so much effort! Looks fab, I love Harry Potter the books and the film, I’m thinking I might read them again when I’m on hols! 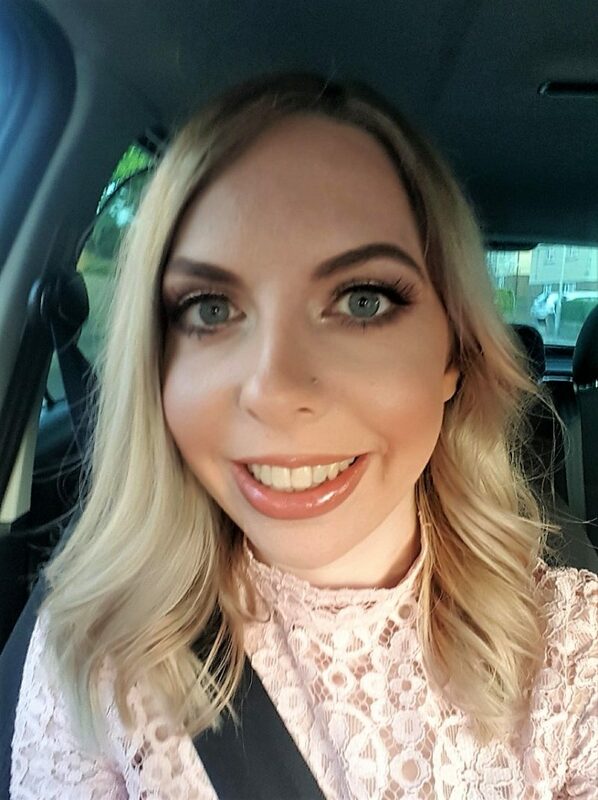 Thanks so much for linking up to the #bestandworst this week! What a lot of effort has gone into this. I can’t believe it’s been 20 years. Where has the time gone? Looks like you’ve had a lot of fun! What a great event 🙂 Looks such fun!